After all the trouble you go through to avoid chemically sprayed foods and toxins in tap and bottled water, now you hear that what you’re wearing may actually be helping to make you sick. But could this really be true? Are clothes toxic? Toxic chemicals are used excessively for processing garment fibers and also for manufacturing clothes. Asian and third world countries manufacture most textiles and clothes, and their industrial pollution and workplace chemical safeguard standards are usually lacking or ignored. This is a bit concerning as clothing clings to our largest organ – the skin. After clothes are made, they are often covered with formaldehyde to keep them from wrinkling or becoming mildewed during shipping. Several severe allergic reactions to formaldehyde have been reported, and investigations have discovered up to 900 times the recommended safe level of formaldehyde in clothing shipped to brand name clothiers from factories in China and Southeast Asia. These synthetic materials are produced with toxic chemicals, and while they may not produce immediate reactions for most, the long term accumulation of these toxins added to our polluted air, water, and food can cause numerous health ailments, including cancer. Clothing that doesn’t require ironing or is labeled wrinkle free may even contain perfluorinated chemical (PFC) used to make Teflon – this chemical is known to cause health issues. Another commonly used clothing or textile factory chemical is nonylphenol ethoxylate (NPE). Known as endocrine disruptors, like BPA, nonylphenos have been dumped into adjacent waterways, killing a lot of fish and wild life. This negative effect on sea wildlife is primarily why various concerned agencies in Europe and America restrict its use. But there are no restrictions where the clothing and textile factories are located in China and Southeast Asia. Dr. Richard Dixon of the World Wildlife Federation warns about the ecological impact on wildlife: “Urgent action is needed to replace hazardous chemicals with safer alternatives especially in clothing and other consumer products.” (Emphasis added). Additionally, black clothing and dyes for leathers often contain p-Phenylenediamine (PPD), which can produce allergic reactions. Carcinogenic flame retardants can appear in bedding and nightwear. Lastly, volatile organic compounds (VOCs) and dioxin-producing bleach are used by textile industries, where the materials for clothing are produced. Dioxin is the active ingredient for Agent Orange. Google that if you weren’t around in the 1970s and ’80s. Given the numerous toxins to avoid in daily life, there is no surprise that most people won’t stress about chemicals in clothing. But there are still some simple measures you can take to reduce toxic exposure. 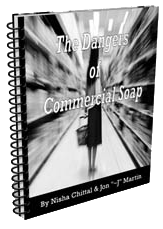 If you launder with common supermarket toxic detergents, switch to natural detergents. It will take a few washings to remove the residual toxic detergent ingredients completely. Read clothing labels and try to avoid synthetic materials such as Rayon, Nylon, Polyester, Acrylic, Acetate or Triacetate as much as possible. Also avoid no-iron, wrinkle free and preshrunk items. Basically, try to stay in the 100% pure cotton zone, or hemp clothing if you see any. Wash and dry clothes containing synthetic materials three times before wearing. Some folks add baking soda (not baking powder) to help neutralize new clothing chemicals while using natural detergents, of course. Also, avoid those dryer sheets that prevent clinging unless you can find them without toxic chemicals. Stay away from dry cleaners that use perchloroethylene, commonly known as PERC. There are actually some that don’t. Find them or forget dry cleaning. Even used clothing purchased from thrift stores may be sprayed with some chemical before they’re put up for sale. Wash and dry them at least once.